The white lotion has a mild floral scent rather than the usual self-tanner stench. It's available in light/medium (shown) and medium/dark. 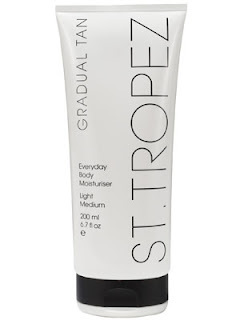 The natural-looking, streak-free results and delicate floral scent set this formula apart from other gradual self-tanners. After a single application, pale skin has a hint of a glow; with a few days of use, it's believably bronze. I am NOT a fan of this product. It left a lot of my body really streaky. A gradual tanner should build up color over days, and not become super bold over night, so if you miss a spot there should not be huge spots everywhere after one use...right? 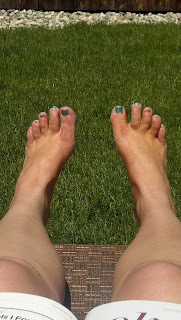 Can you see my ultra streaky feet? It messed my arms up big time too, but that was less evident on camera. Wasn't a fan of my new oompa loompa orange hue either! Stay tuned for more self tanning posts! We've been on a roll this summer! I had the same problem with this product. Super streaky! I don't use self-tanning products often so I wasn't sure how much of the uneven application was my fault versus the product, so I'm glad to see I'm not the only one that had an issue!